Once upon a time there was a boy who was passionate about audio. Every day he talked to other sound engineers and sound designers, and one day he started publishing those conversations. Over time, he gained many followers and was inspired to publish an eBook to help them build careers in pro audio. This is the book that I needed in college when I was trying to figure out what to do with myself, unaware of the many opportunities and paths available to me as a sound engineer. This is the book of fresh ideas, reminding me of all the creativity I can bring to the job, that I needed when I started to get burned out. And this is book that I need now to create a sense of community in an industry that often feels lonely and under-served. 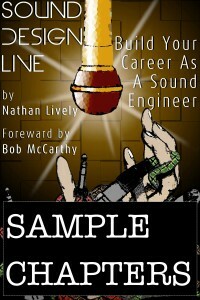 Please download these sample chapters from Sound Design Live: Build Your Career As A Sound Engineer as thanks for being part of the Sound Design Live community. They include Why I Started Sound Design Live, How To Use This eBook, and Working With Technical Limitations. The Sound Design Live eBook Is Live!